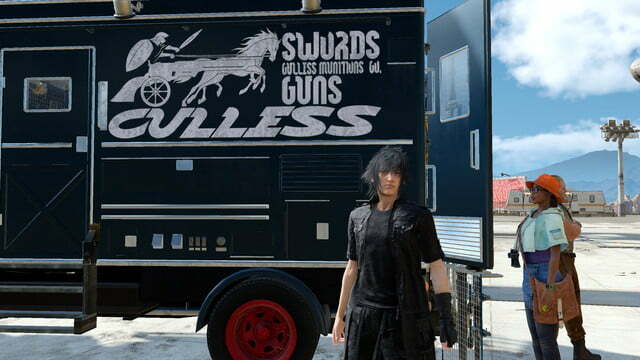 Final Fantasy XV is a gorgeous game. The art design, the detail, every square inch of this game is a feast for the eyes — if you have the right hardware. Unlike its console counterpart, finding a balance between visual quality and performance is a bit of a chore, but we have a few tips that should help you get the most out of the game. First up, let’s talk about how we tested Final Fantasy XV. The system we used is a desktop PC with an AMD Ryzen Threadripper 1920X 12-core processor. That’s a lot of horsepower, and we’re aware that it’s pretty far outside the norm for all but the most high-end desktop PCs, but we use it for a reason. It’s among the quickest processors you can get your hands on, which means our results won’t be bottlenecked by a slow processor. That’s also why our testing PC has 32GB of RAM, and a lightning-fast 512GB SSD. We want to remove all the speedbumps that could trip up our results. That means the results we discuss below will be almost entirely dependent on the graphics card, arguably the most important part of any desktop gaming PC. The graphics cards we tested fall into every price category up and down the scale, as we wanted to get a wide sample to find out how well the game does on even entry-level hardware. On the Nvidia side, we tested the entire GTX lineup and two Ti-grade graphics cards: The GTX 1080 Ti, GTX 1070 Ti, GTX 1060, and GTX 1050. The red team, AMD, has a slightly larger catalogue of current-gen graphics cards, so we picked four of our favorites — the RX Vega 64, RX 580, RX 570, and RX 550. For those of you keeping score, that’s two high-end cards, a mid-range card, and an entry-level card. It’s a nice sample from each tier of AMD’s graphics card lineup. 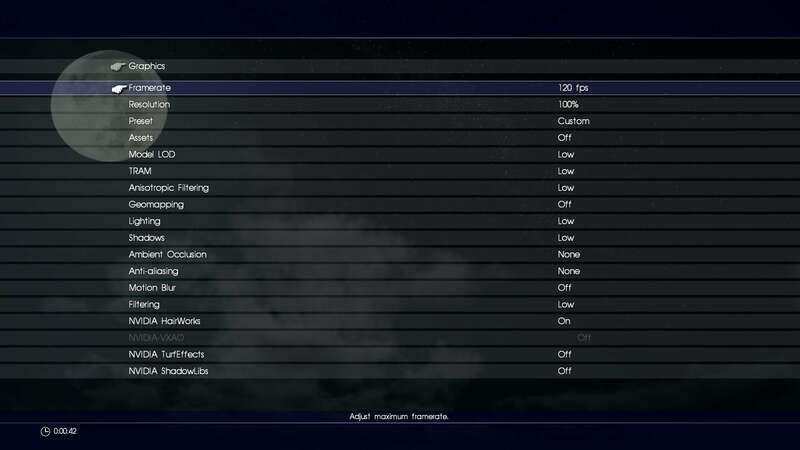 Every game’s preset settings differ, but it’s always helpful to take a look at what amounts to the developer’s suggested graphics settings. 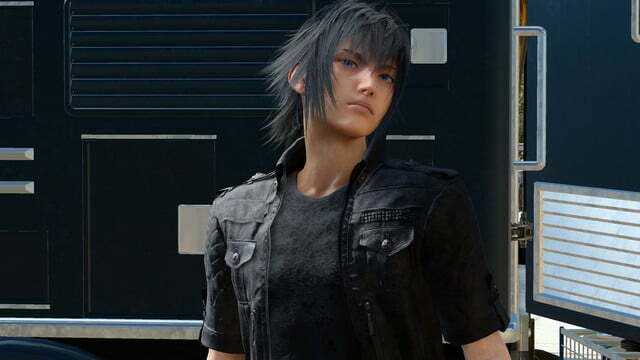 Like most games, FFXV offers four presets — Low, Average, High, and Highest. 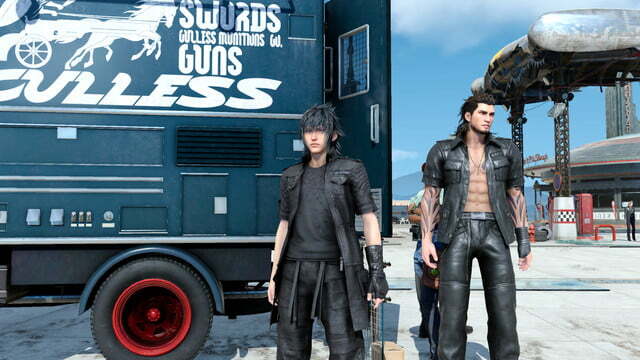 Here, there’s a clear difference at each level but pay extra-close attention to Noctis’ clothes. 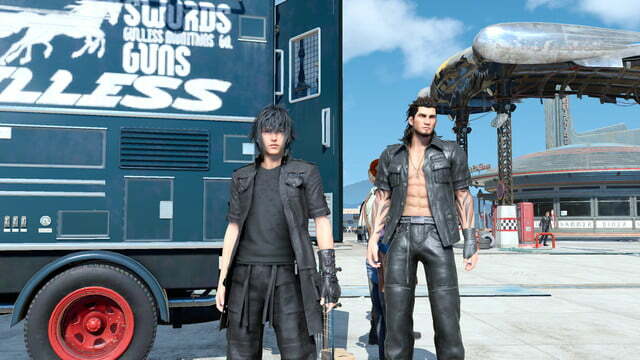 FFXV’s bro-squad is the game’s heart and soul, so it’s no surprise they receive lavish detail. Turning up the game’s graphics make those extras obvious. Buttons, zippers, and other pieces of flair become obvious at High detail, and really stand out at Highest. 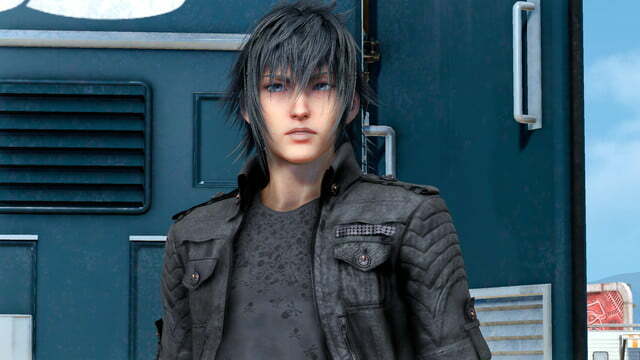 The realism of each character’s clothing also improves dramatically as detail is ramped up. 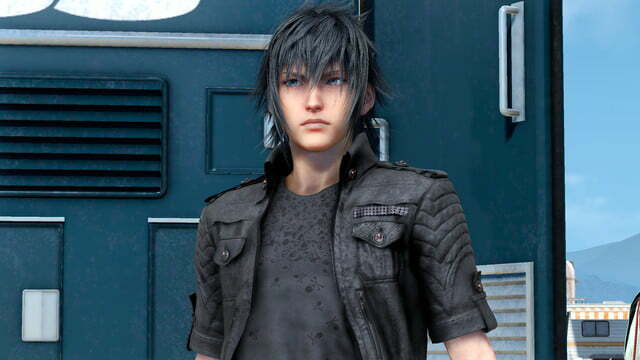 At Low detail, the team’s leather jackets look fuzzy and lack fine detail, which makes them look like poorly built fakes purchased from eBay. Average is a big improvement, adding fine details that provide a better sense of depth and texture. At Highest, those details become crisp even when close to the camera. 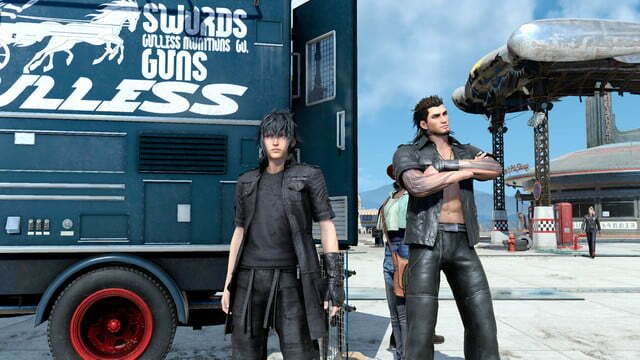 FFXV’s bro-squad is the game’s heart and soul, so it’s no surprise they receive lavish detail. Low and Average detail also suffer from a lack of shadow detail and depth which, combined with lower texture resolution, hurts the overall presentation’s contrast. 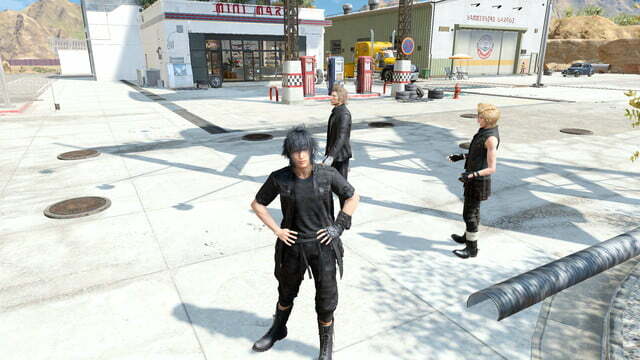 Objects further from the camera, like the diner in the background, look flat and washed-out at Low and an Average. 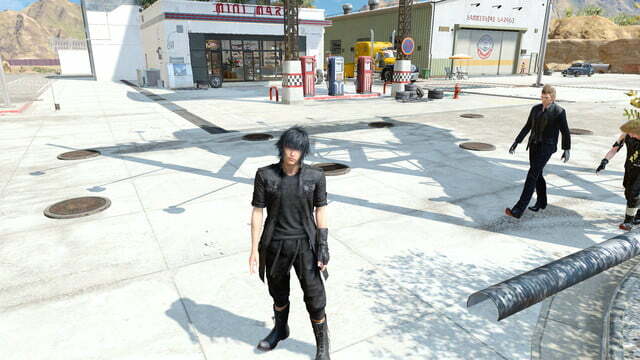 The High and Highest settings add shadow details that noticeably improve the game’s look. Still, FFXIV tolerates its lower presets with grace, and some elements suffer little from downgrades. Each character’s face, flesh tones, and hair see less degradation then we might’ve expected, even at Low detail. 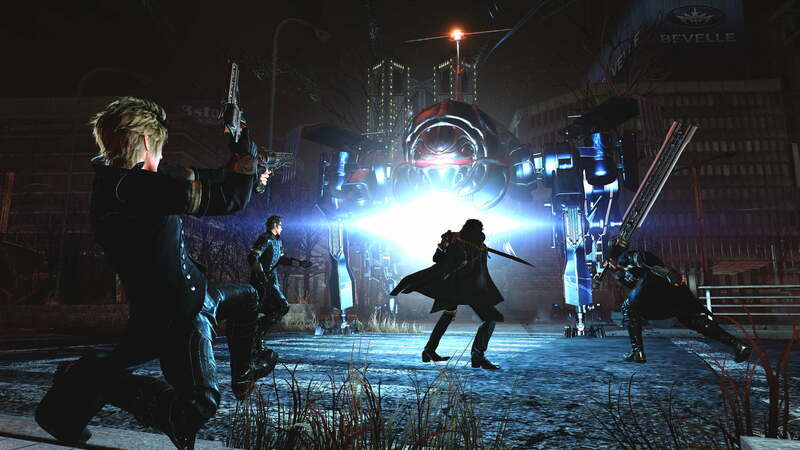 The game’s strong art design helps, as both characters and environments have readily visible themes that don’t rely on fine details to express themselves. Obviously, it’s best to play at the highest detail possible, but we think FFXIV looks great even at Average detail, and even Low is alright, though its texture resolution suffers. This, as you’ll soon see, means the game is enjoyable on a wide variety of hardware. Right here, performance breaks along predictable lines. The 1080 Ti is in the lead by a sizable margin, while the 1070 Ti, and AMD Radeon RX Vega 64 achieve playable framerates, if only barely. There are a couple things we can learn from these results right off the bat. First, look at the GTX 1050, and RX 550. Neither card can run this game in 4K. We could barely get in and out of the game because it ran so slowly on both cards. It was a slideshow. 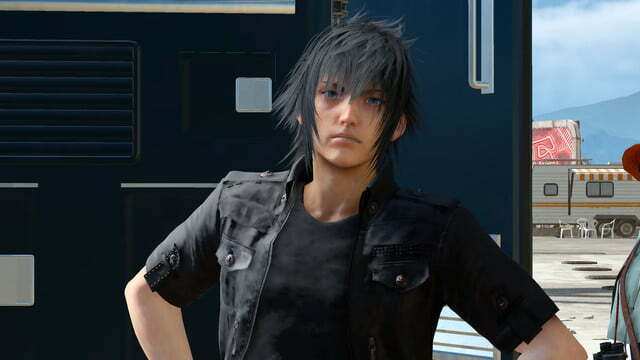 It’s worth mentioning because our GTX 1050 and RX 550 cards both had 2GB of video memory, and that’s definitely not enough to handle FFXV at this resolution. 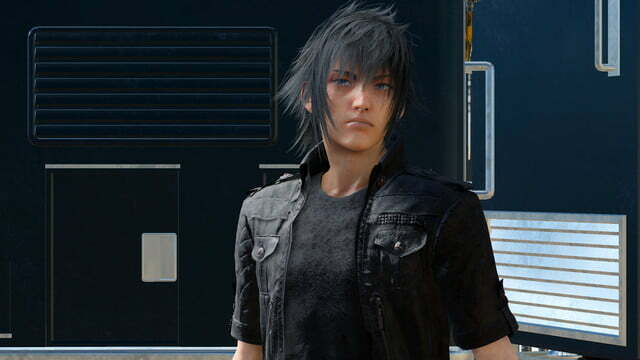 Unsurprisingly, Final Fantasy XV looks especially great at 4K. High-end cards like the RX Vega 64 and GTX 1080 Ti have a lot more than that — the Vega 64 has 8GB, and the 1080 Ti has a whopping 11GB. The performance gap between these sets of cards tells us that this game not only requires a lot of graphical horsepower, but also a sizable amount of video memory. That’s why cards closer to the mid-range like the 1070 Ti and 1060 have an easier time running the game at 4K on Average or Low settings. They have enough video memory to handle those assets like textures and models, alongside the rendering horsepower to keep the game running smoothly. 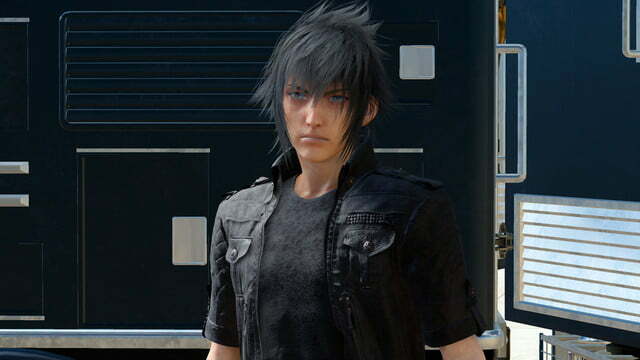 In the end, if you’re looking to run FFXV at 4K, you’re going to want to stick with upper tier of graphics hardware. The lowest you’ll want to go is the GTX 1070 Ti or Radeon RX Vega 64. At 1440p, performance widens up a bit, and that’s good news if you don’t have a GTX 1080 Ti lying around. This resolution is a great middle ground. You can still enjoy crisp image quality, but you give yourself a ton of wiggle room to keep framerates high. Look at those framerates! 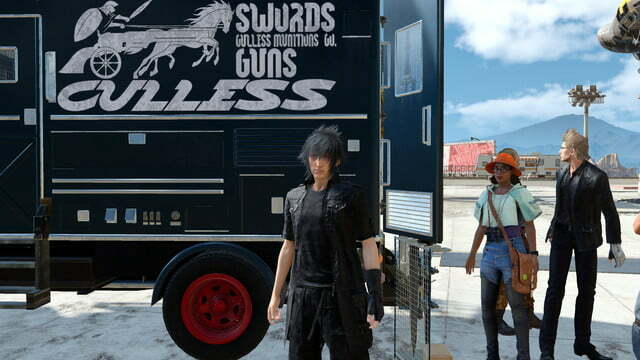 At 1440p Final Fantasy XV still looks great, and it’s easy enough on mid-range hardware that you won’t be stuck in a slideshow every time you draw your sword. Yes, your sword materializes in a shower of blue sparkles every time you draw it. It’s a whole thing. Looking at our test data, the only cards that couldn’t run the game at 1440p were the GTX 1050 and RX 550. All the others were more than capable of maintaining an enjoyable framerate at Medium or High settings. Even the mid-range GTX 1060 maintained a playable framerate of 36 FPS at 1440p, at the Highest detail preset. The RX 570 had a bit of a tougher time, but plays the game just fine at High settings, and you won’t even notice the loss in detail. Finally, we come to the most common resolution – 1080p. Here, almost every card in our test suite managed a playable framerate most of the time. Well, with one exception. Let’s get to the numbers. Even the mid-range cards, starting with the GTX 1060, did well enough. At the Highest detail preset, the GTX 1060 hit an average framerate of 49 FPS, and the RX 570 hit a just-barely-playable 29 FPS at the High preset. The entry-level cards were a mixed bag, though. The GTX 1050 managed a comfortable framerate, 31 FPS, at the lowest detail setting. The RX 550 barely managed 24 FPS on average at the same detail setting. It’s a disappointing result for anyone with an RX 550. If you’re one of those people, try stepping your resolution down to 720p — you should be able to manage a decent framerate at that resolution. All right, let’s dig into the nuts and bolts of the graphics menu. Like most games, you’re going to find tons of options here. Each one controls a specific part of the game’s visual palette. On their own, most of these settings will only impact your performance a small amount, but taken together, they can make your game look great, or run poorly, depending on your hardware. If you’re not comfortable tweaking some of these settings, we have some good news for you. It’s not worth it. No, you read that right. This is our first performance guide where we would actually recommend you stick with the presets if you want the best performance and the best graphics your hardware can handle. Each preset is so well-tuned, we couldn’t improve on them. 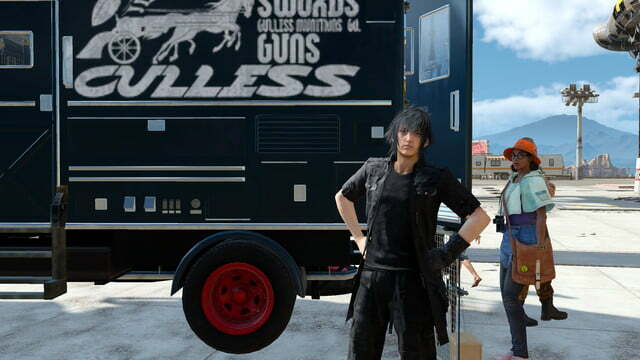 Square Enix really did their homework here. Each preset — Low, Average, High, and Highest — is custom-tuned to such a degree that we couldn’t actually improve on them despite our best efforts. We went through each setting and measured out precisely how big an impact each one had on overall performance. In the end, we found that the built-in quality presets mitigate those performance hits better than anything we could put together. Still, there are a few settings you should keep an eye on if you find you’re hitting performance snags. TRAM, or Texture RAM, is one of the biggest performance hogs. Turned all the way up, we lost 11 percent of our overall framerate. This setting governs how much of your video memory is earmarked for game textures, which is why you’ll definitely notice when it’s turned up or down. 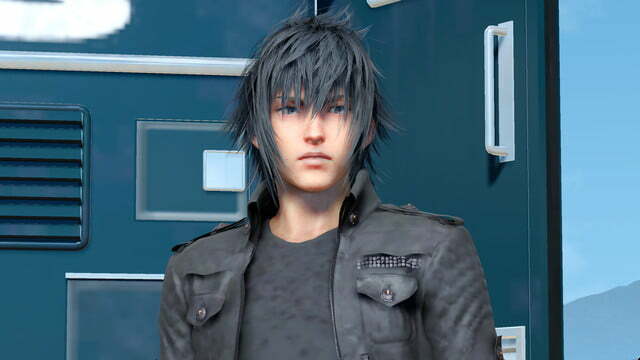 Look at how detailed every single piece of Noctis’ outfit is at the Highest TRAM setting. 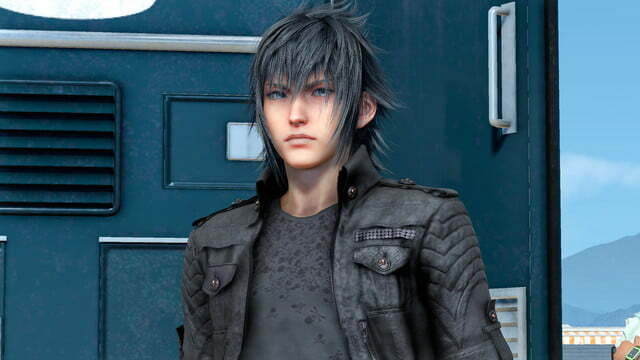 His buttons have little skulls on them, his t-shirt has skulls on it, even the many extraneous zippers on his outfit has an impeccable level of detail. Stepping down the quality to High, you lose a little detail, but the biggest hit comes at Average. Here, you lose almost all of the fine detail, and moving down to Low, you lose all but the barest suggestion of these details. Second place, as usual, goes to the Shadows setting. 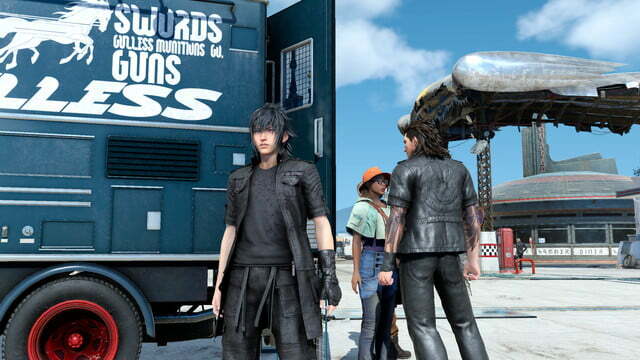 Like TRAM, this one affects nearly every single frame of Final Fantasy XV, so it’s no wonder that when it was turned all the way down, we saw a 10 percent bump in performance. Look at those friends, standing in our shadows, messing up our screenshots. They’re actually doing us a favor. Keep an eye on the edges of the shadows as you scroll through the screenshots. At the Highest setting, they’re sharp, detailed, and lush. At the Low setting, they’re fuzzy and amorphous — though they don’t look awful. 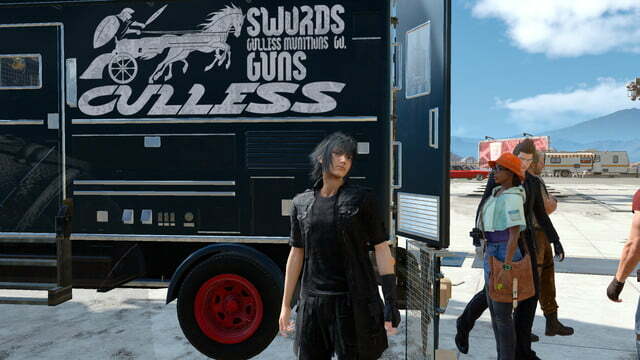 In the end, Final Fantasy XV will look great pretty much no matter what you do to it. Even at the lowest settings, it’s still a gorgeous game, and that’s a credit to stellar art direction and a richly detailed world. If you’re having trouble maintaining an acceptable framerate, try stepping down to the next lowest preset, chances are it’s going to offer better performance and visual quality than digging into the settings yourself. It’s good the game’s art holds up at lower settings, because you may need to use them. That’s particularly true if you want to run at 60 frames per second. Falling back to 30 frames per second shows some mercy on your hardware. 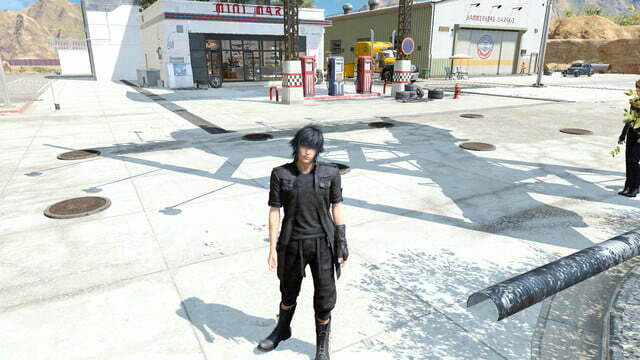 We can certainly recommend FFXV if you want a graphical showcase, but be prepared. This game can challenge even the quickest PCs.